The national drink of England is an ale called “Bitter”, designated as “Ordinary”, “Best”, and “Extra Special Bitter”, or ESB, depending on its strength and body. Since World War II, American soldiers returned stateside knowing bitters as the most popular drink in the realm of British beer drinkers. The word “Bitter” itself is a reference to the hoppy dryness of these beers versus that of milder brews. Bitters always have a signature hoppy dryness, but also can contain a suggestion of soft-fruit. Paradoxically, not all bitters are necessarily bitter at all; in fact, they can tend toward the sweeter side, although they will most certainly possess a hop emphasis. The color of bitters can vary quite a bit from one to the next but they do share one trait: Bitters are almost always translucent in color. They’ll run the gamut from rich copper red to golden to pale bronze. When bitters are vibrantly red colored, they are sometimes compared to the red wines from Bordeaux. Blue Ridge ESB is just such a coppery red color, which instantly distinguishes it from the rest. Expect some caramel notes and floral hops on the nose with a touch of pine and a hint of chocolate. Expect the flavor profile to follow suit with sweet, lightly toasted caramel malts and a tight bitterness in the finish along with gentle floral hop tones, true-to-style. Many domestic ESBs we’ve sampled tend to exhibit a lot of range and variation to them. As a style, there are a lot of liberties taken domestically when “interpreting” this style. The Blue Ridge ESB is a dead on, traditional, true-to-style ESB, which no doubt contributed to its recent rating of “Highly Recommended” by the Beverage Testing Institute. Enjoy with a medium-rare steak or roast, or over some spicy lobster. Founded in 1993 by Kevin Brannon, a former attorney with a penchant for home-brewing, and Marjorie McGinnis, a psychology student with a genuine love of our favorite malty nectar, the Frederick Brewing Company is currently enjoying their 2nd decade of craft brewing excellence. Although the Mid-Atlantic region was their original market (as they are based in Frederick, Maryland), their distribution has expanded to include the Mid-West as well. These days, beer connoisseurs in more than 20 states enjoy their products. They have seen continued growth over the years, selling 660 barrels of their tasty brew in 1993 to 21,577 barrels in 1999. In order to keep up with demand, in 1997 they completed construction of their new brewery which bumped up their brewing capacity to 100,000 barrels per year. Obviously thinking big, they designed the facility to easily expand to a 300,000 barrels per year capacity! We hope they find themselves needing to take advantage of their forward-thinking design plans, as these guys brew some really tasty beers and are all around good people, in our humble opinions. It would seem that they are well on their way—they’re already the Mid-Atlantic’s largest craft brewery. Between their first Brewmaster, Steve Nordahl, and their current Siebel Institute Educated Brewmaster Daniel Maerzluft, the Frederick B.C. 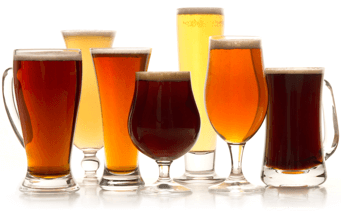 has crafted no less than 26 styles of fresh, full flavored beers since their inception. Across all these varied styles one thing is a steadfast constant: they use only the finest barley and hops to brew their award-winning beers. As they put it themselves, “it takes first-class ingredients to make first-class brews.” And we couldn’t agree more! 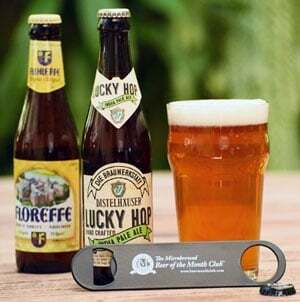 Exceptional flavor and superior quality have won their beers medals and top honors around the world, giving them a reputation for quality even in regions where their beer is not yet available. Case-in-point was their inclusion in Food & Wine Magazine’s 1998 editor’s choice list of America’s top breweries. In selecting the winners, the editors of the magazine said they relied upon the “informed opinions of bartenders, beer writers and editors and industry analysts.” The editors also researched the results of ten years’ worth of beer festival contests to see which breweries performed the most consistently. As you may have surmised from our description thus far, Frederick Brewing is one of the fastest-growing craft breweries in America. And they hold the distinction of being one of only two purpose-built craft breweries on the East Coast. In other words, they are not a restaurant or brewpub; their only focus is making great beer, period. And here’s an interesting bit of American beer trivia: in 1997, Frederick B.C. came out with the first beer in America to be brewed with hemp seeds—their Hempen Ale. In the fall of that year Frederick also brewed a second beer brewed with hemp—the Hempen Gold, which is a lighter-bodied cream ale. Frederick Brewing Company is open for tours every Saturday and we think everyone ought to visit them if ever in the vicinity of Frederick, Maryland. Their knowledgeable and friendly tour guides will be more than happy to answer any of your questions, while offering you a selection of over 10 of their fine beers to taste in their taproom. For more information about the brewery and scheduled tours, call (301) 694-7899 or check out their web site at www.frederickbrewing.com.